For those who have never homebrewed, it can seem like a complicated, overwhelming process. But that is only the start of the misconceptions, says Bill Campbell, owner of Brewmented Homebrew Store, Brewery, and Tap Room in Longmont. “There are common and inaccurate misconceptions that homebrewing is more difficult than it is, requires a ton of equipment, and is a solo activity,” Campbell says. Pictured: Meet the Brewer night which happens the first Friday of every month at Brewmented. Photo: courtesy Brewmented. On the contrary, Campbell highlights all-in-one brewing systems that can be used in any space, regardless of size. He describes homebrewing as a very social activity, with groups coming in his store to brew together. 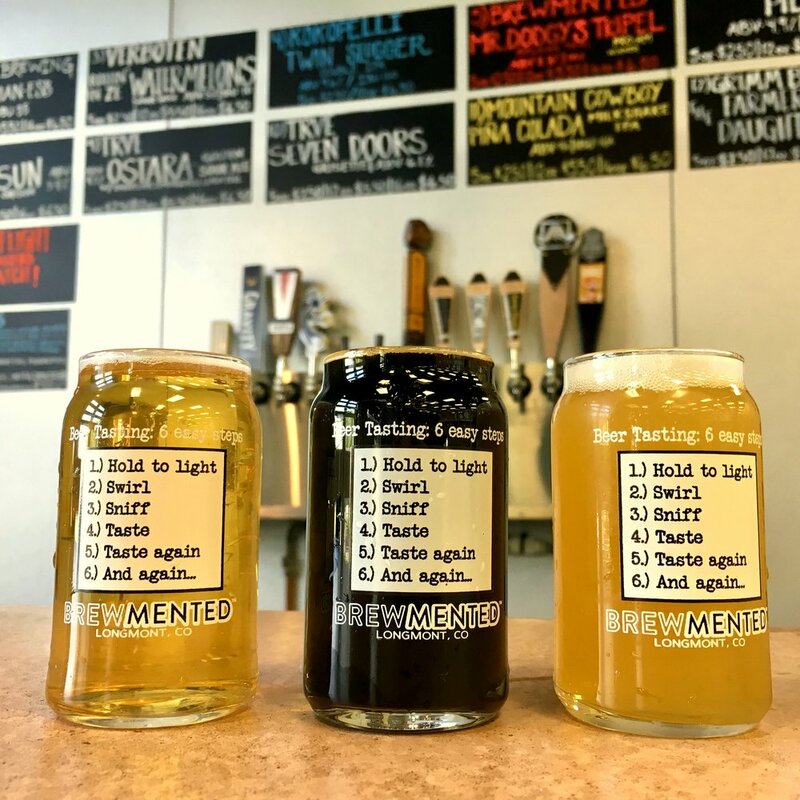 The social aspect is echoed in Brewmented’s large array of events designed to engage the community in the kid- and dog-friendly space – free classes to learn to brew, trivia, meet the brewer and tap-takeover nights. The shop offers much more than aisles of brewing equipment. In fact, the nucleus of the bright and roomy spot is the tap room, which seems to always have something going on – from beer historians giving lectures to the Broncos’ game. Fourteen taps are constantly rotating something new and interesting and consist of beers you won’t typically find in Longmont. Of the bunch, there are four beers brewed in-house that are small batch, creative, and designed to highlight all you can do with brewing ingredients. “You’re always going to get something new and neat when you come in here,” Campbell says. Patrons can grab a pint and browse the store for brewing needs, as well as wine, kombucha and cider. It makes for a fun, less intimidating way to explore the world of homebrewing. One thing that is important to Bill is making the store a comfortable spot for everyone, including women, who make up a low percentage of the homebrewing community. When he heard that only 10 percent of homebrewers were women, he knew there was both a problem in the industry and an opportunity. There are now women-only events and women-led learn-to-brew classes. Female beer organizations such as Barley’s Angels and Ales for Females have hosted events in the tap room. Most importantly, three of the six employees are women at Brewmented Homebrew Store. Mike Burns, Homebrewing Ambassador. Photo: courtesy Brewmented. The knowledgeable, friendly staff is what makes Brewmented great for men and women. “We all remember what it was like to brew our first beer,” laughs Campbell. Besides answering questions in the store, the team is more than happy to field brewing questions. One the coolest parts of Brewmented, whether you’re an avid brewer or newbie, is the assistance provided couples that want to brew their own unique beer for an upcoming wedding. Duos can meet with the Brewmented team to plan a brew, then come back with friends and family for a hands-on brewing experience. Once the big day comes, the beer is then available in kegs or bottles to be served on your big day for a fun, personal touch.